6753 ✉ 93UDD 60 Pfg. 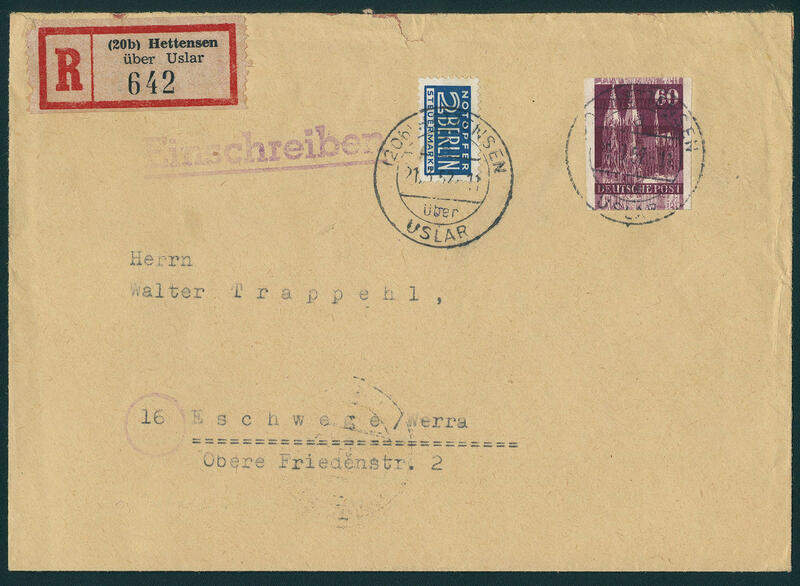 Buildings, four sides unperforated with clear displaced double impression, possibly from the spoilage, unopposed used on registered cover, cover small tear, from \"HETTENSEN 21.3.52\" to Eschwege with arrival postmark. Very decorative and rare! 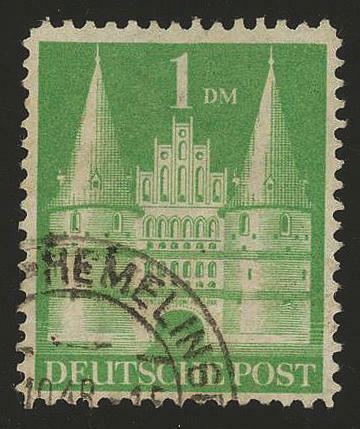 6754 ⊙ 97aIZD 1 DM buildings, watermark 1 Z, perforated L11:11 1 / 2, neat cancelled superb item, expertized Dr. Wittmann. Michel 1200,- €. 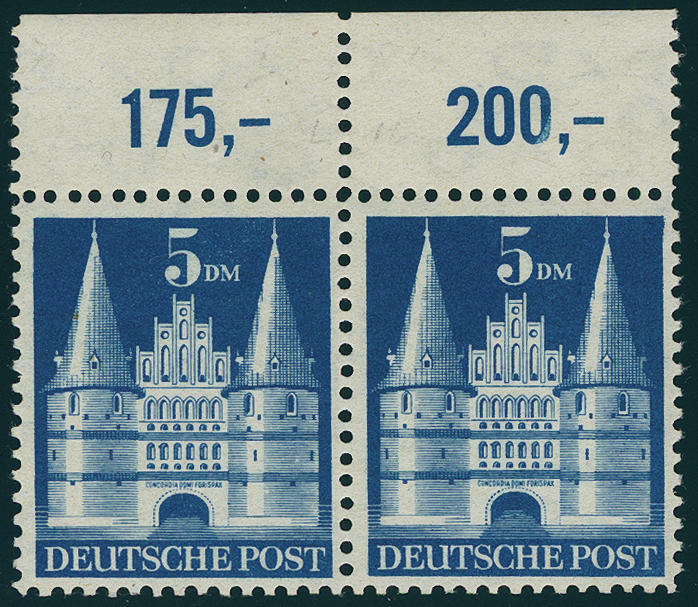 6755 97bbIIYT 1 DM buildings, vertical corner margin pair lower right perforated L14:K14:L14:L14, middle perforation row prefolded, in perfect condition mint never hinged Michel 600,- €. 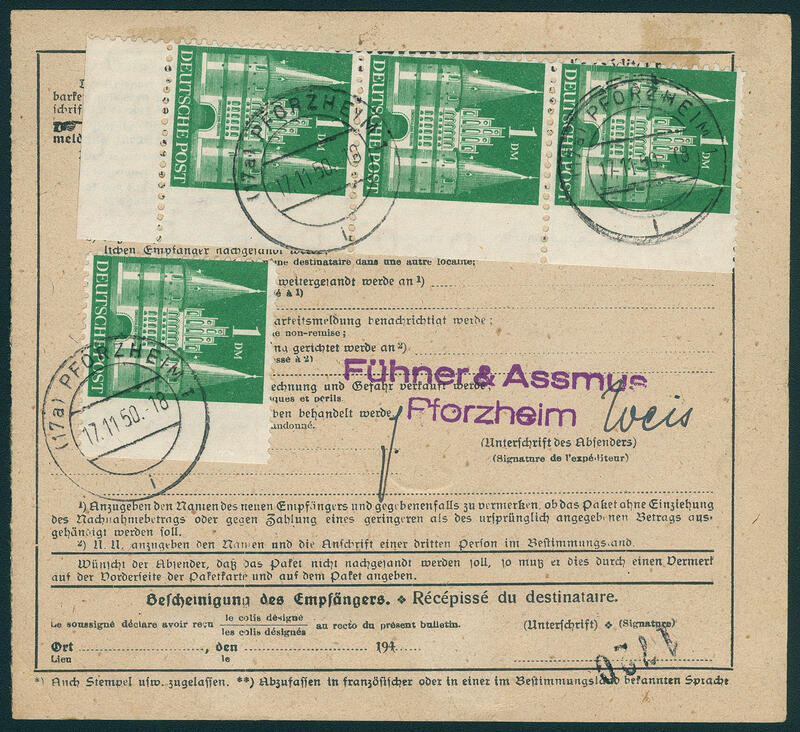 6756 ⊙ 97bII3YB 1 DM buildings with very scarce watermark \"waved lines\", as usual not perfect perforated, neat cancelled, a nearly always missing issue. Michel 3000,- €. 6757 ✉ 97bIIYBUes 1 DM buildings, vertical corner margin strip of three lower right and another copy from right margin of sheet, all right unperforated, reverse on package card with additional franking 40 Pfg. In the vertical pair and 10 Pfg. 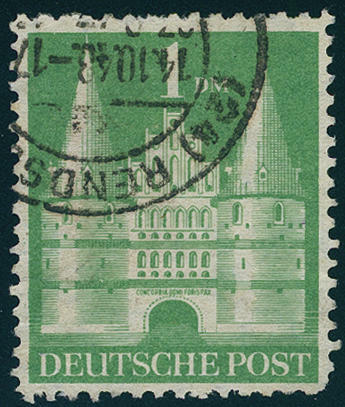 Buildings on package card from \"PFORZHEIM 17.11.50. 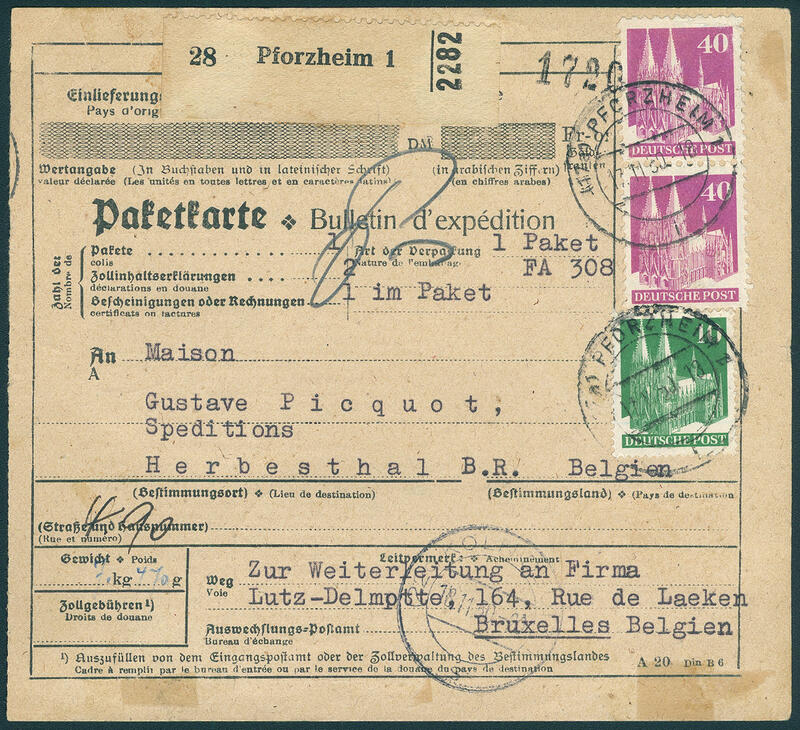 \" to Belgium. A commercially use from same four partially perforated copies of the top value places one of the great valuables the buildings issue dar! Photo expertize Stemmler BPP. 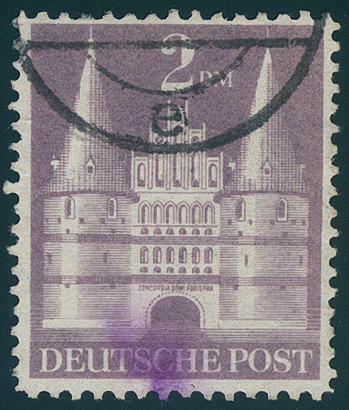 6758 ⊙ 97IZD 1 DM buildings 1948, type I, rare watermark Z with mixed perforation L11:11 1 / 2, at the bottom on the right corner perforation fault, otherwise in perfect condition and neat cancelled a very scarce undervalued stamp, the in almost all collections is absent! Photo expertize Novak BPP. 6759 ⊙ 98IYD 2 DM. Buildings, type I, watermark 1 Y, scarce mixed perforation L11:11 1 / 2, neat cancelled, ink stain and two negligible paper creases, there are only few examples this issues have become known, by Michel undervalued, photo expertize Novak BPP. 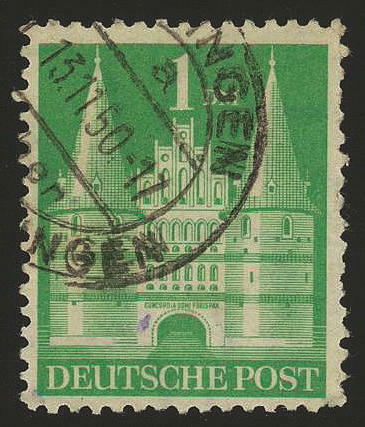 6760 99IYB,99IaYB 3 DM buildings, vertical pair from the left lower corner of the sheet, perforated L11, the types I and Ia se-tenant, in perfect condition mint never hinged, a very nice unit, expertized Novak BPP. 6761 100I/II 5 DM buildings, horizontal upper margin pair with short respectively long stair se-tenant, unfolded, in perfect condition mint never hinged, rare, expertized Novak BPP. 6762 ✉ 100II 5 DM buildings, high stair, horizontal pair with additional franking 5 Pfg., round corner, as well pair the 40 Pfg. 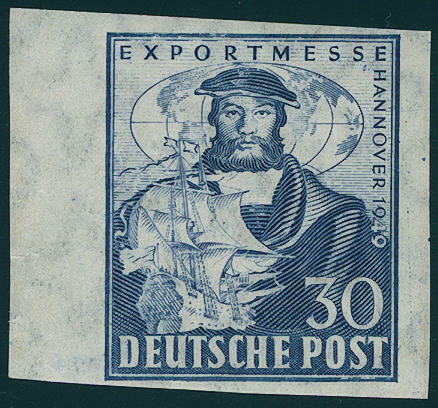 On complete package card from \"ISERLOHN 25.5.50. 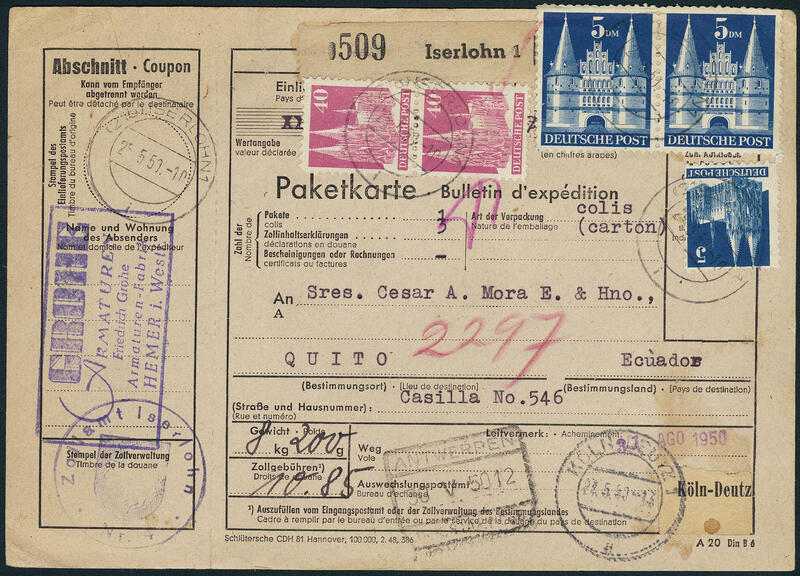 \" to Quito / Ecuador. Package cards the buildings issue with so high frankings from South America are extraordinarily rare! 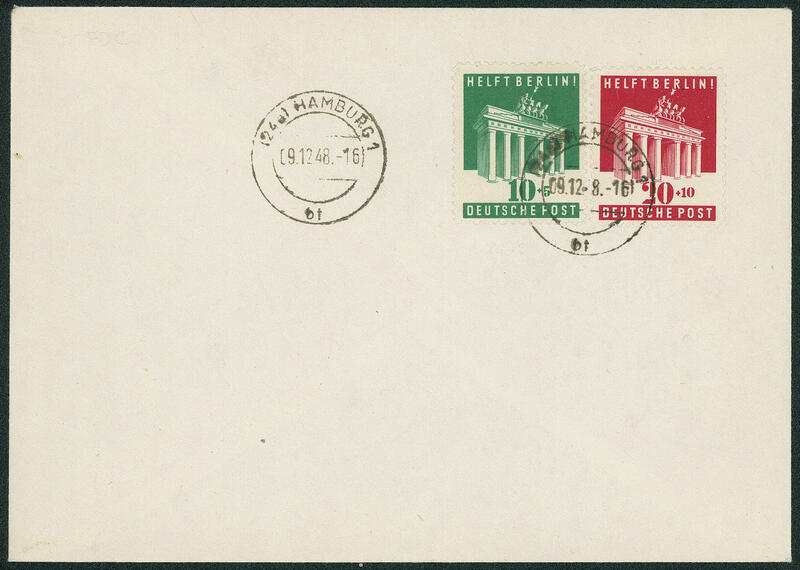 6763 FDC 101/02 Helps Berlin 1948, in perfect condition on very nice white First Day Cover from \"Hamburg 9.12.48. \". This is an extremely rare early use, still 5 days before the officially first day. There are very few examples from this known. (see Michel special catalogue page 899). 6764 105aU 30 Pfg. Export fair 1949 four sides unperforated from left margin of sheet mint never hinged, tiny fingerprints, margin of sheet unused. An extremely scarce variety, of the very few examples have become known. Due to missing offers also in the Michel special catalogue only noted without price! Photo expertize Schlegel BPP. 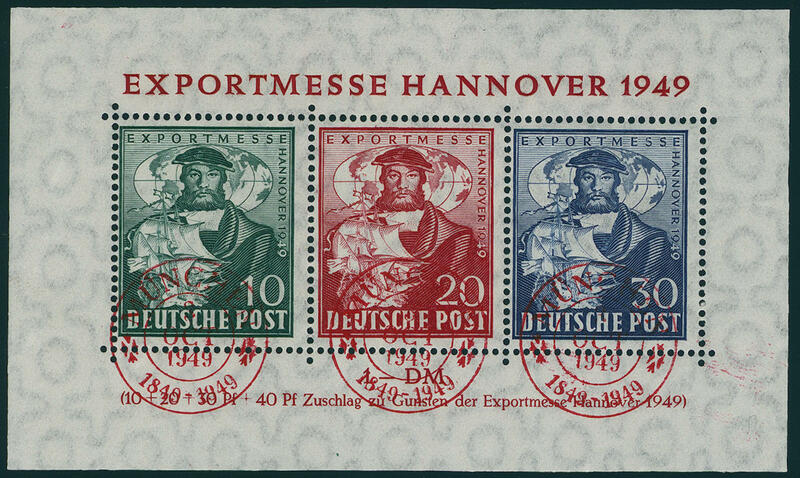 6765 ⊙ Bl.1a Export fair souvenir sheet 1949, fresh colors and in perfect condition with on of this issue scarce red special cancel \"Munich 3. OCT. 1949\" in perfect condition. A lover souvenir sheet! Expertized Schlegel BPP. 6766 ⊙ Bl.1a Export fair souvenir sheet 1949, as well the 20 Pfg. 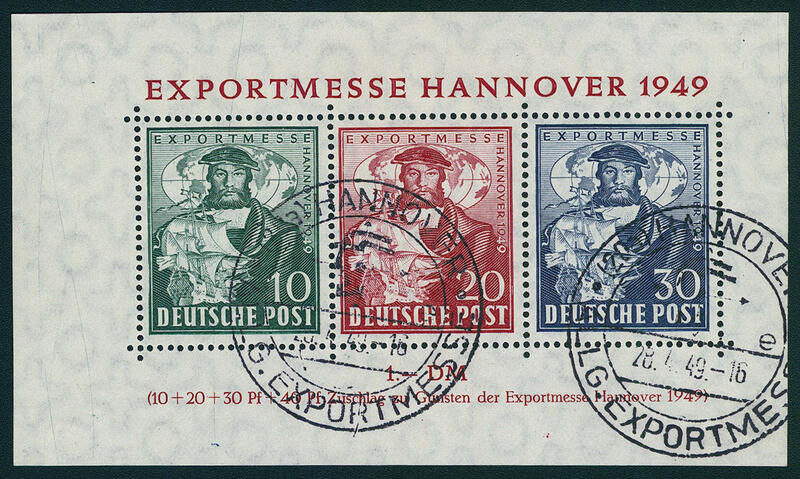 To the top shifted, in perfect condition with special cancellation \"Hanover 28.4.49\", expertized Schlegel BPP. 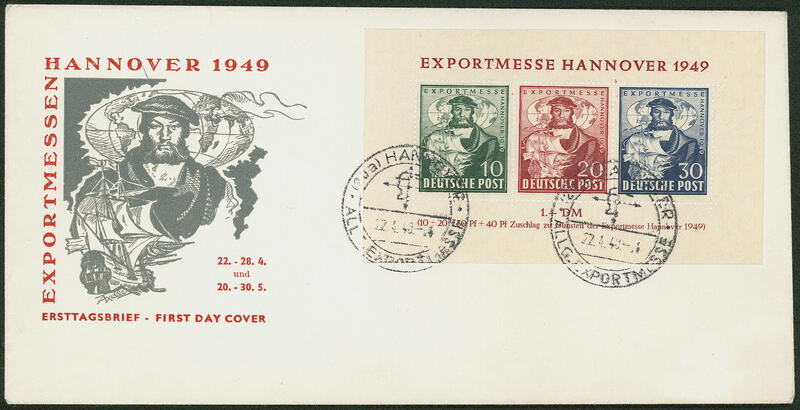 6767 FDC Bl.1a Export fair souvenir sheet 1949 on faultless illustrated First Day Cover with first day special cancel \"Hanover 22.4.49. \" to New York addressed. Michel 500,- €. 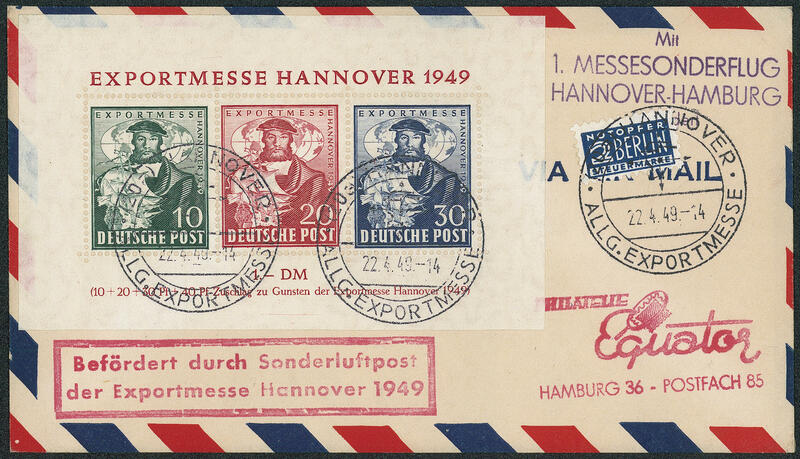 6768 FDC Bl.1a Export fair souvenir sheet 1949 on faultless airmail First Day Cover with first day special cancel \"Hanover 22.4.49. \" to Hamburg, photo expertize Schlegel BPP. Michel 500,- €. 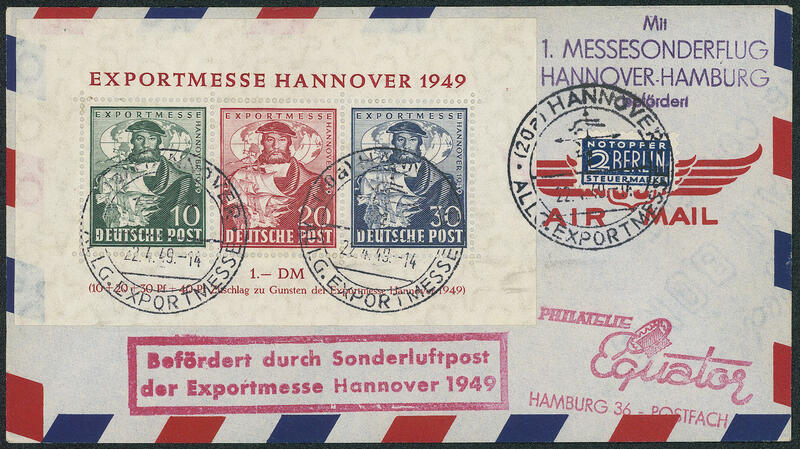 6769 FDC Bl.1a Export fair souvenir sheet 1949, in perfect condition on very nice airmail First Day Cover with first day special cancel \"Hanover 22.4.49\" with red special confirmation stamp to Hamburg. Michel 500,- €. 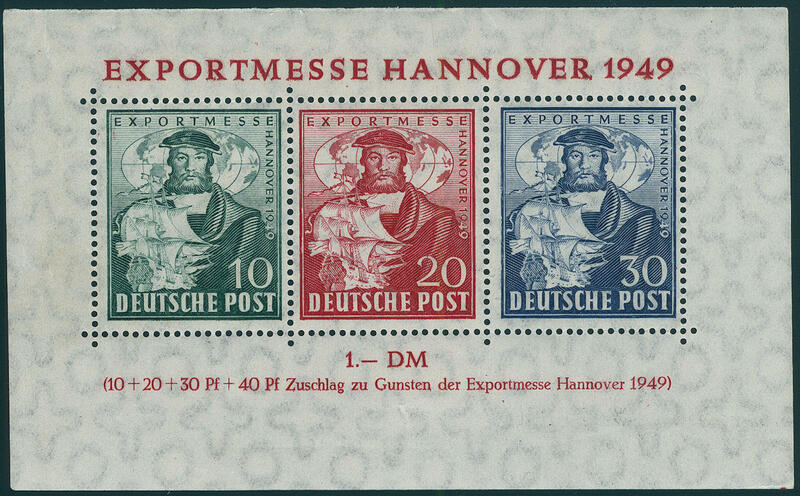 6770 FDC Bl.1a Export fair souvenir sheet 1949 on faultless illustrated First Day Cover with first day special cancel \"Hanover 22.4.49\". Michel 500,- €. 6771 Bl.1aAbart Export fair souvenir sheet 1949 in prominent oversize \"110:68 mm in lieu of 110:65 mm\", in perfect condition mint never hinged very distinctive and scarce variety! 6772 ⊙ Bl.1aAbart Export fair souvenir sheet 1949 distinctive damaged in cutting. 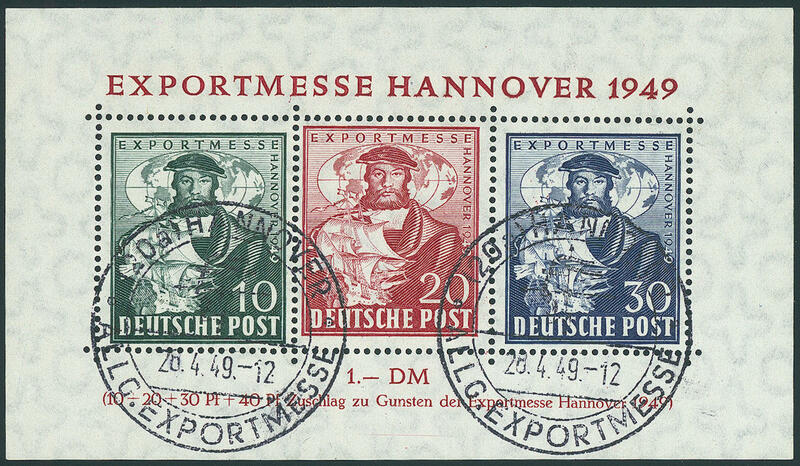 Through it left margin 17, 5 mm and right 9 mm, in perfect condition and in original size with appropriate special cancel \"Hanover 28.4.49. \". Scarce variety!